Similar to the feeling of a sports arena, the visceral power of enormity is a major draw. However, Drake didn’t just choose the paintings because they are big; he chose them because they are big for a reason. “Scale is so seductive for so many artists… a lot aren’t using scale in a meaningful way,” describes Drake. “They’re just doing big, bombastic paintings because they can.” But for the five artists whose work is included—Eric Fischl, Jenny Saville, Neo Rauch, Mark Tansey, and Vincent Desiderio—a large canvas is indispensible to their style, subject, or both. The overall point, Drake argues, is that the artists “are putting themselves on the Western canon, by working on that scale.” That is to say, the painters are following a tradition of Michelangelo, Picasso, and perhaps most recently, Chuck Close, who used scale as an essential part of some or all their works. The size of the paintings, the smallest of which is around five by seven feet, for the most part represents the artists’ single connecting thread, besides their relationships with the Academy. Rauch is German, Saville is British, and Fischl, Tansey, and Desiderio are American. Saville, considered a member of the Young British Artists, is younger than the others by about two decades. All are figurative painters, though their individual takes reflect distinct degrees of realism. 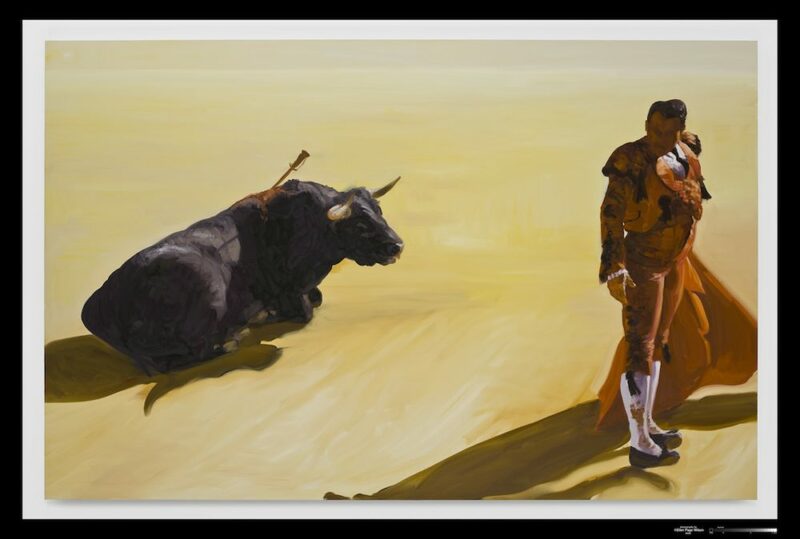 Desiderio’s allegorical Quixote (2008) is photorealistic triptych that tells an uncanny narrative involving a piano, a bike’s shadow, and a pig carcass (choose your own adventure). In Tansey’s Coastline Measure (1987), the “architecture of the painting is photographic,” explains Drake, so from far away it seems to be an imitation of reality. Only up close do curious details–a sphinx, and an infinite rocky pattern– become perceptible. Meanwhile, Saville’s Bleach (2008) is actually based off a photograph, yet appears painterly compared to the other works. “What you’re left with is this beautiful gesture and formal intelligence,” says Drake of Saville’s portrait. Drake, who is himself an artist with pieces in the Whitney Museum, Museum of Contemporary Art Los Angeles, and more, is wary of the many forces that might push artists away from their ultimate vision, big or small. “There are some critics that are against the idea of a signature style,” he explains. “[‘The Big Picture’] is in many ways the opposition to that view. It’s about singular visions, and it is about people who have clear voices.” The show’s voices are not only clear, but loud too, and it’s a great, colorful racket they make. “THE BIG PICTURE” WILL BE ON DISPLAY AT THE NEW YORK ACADEMY OF ART THROUGH MARCH 2. FOR MORE ON PETER DRAKE, VISIT HIS WEBSITE.